How do bees make honey? And... what about why they make it? Honey is made by a colony of honey bees (Apis mellifera) living in a nest (in the wild) or in a hive if kept by a beekeeper. A typical bee hive will house about 60,000 bees, most of them workers, industriously making honey and the honeycombs in which the honey is stored. Bees certainly have to work very hard to make it, with endless trips to flowers to collect nectar. "A bee is an exquisite chemist!" How right he was! What special little creatures honey bees are. But first, here are some amazing facts and figures you might like to think about, next time you’re tucking into honey on pancakes! To produce a pound of honey, foraging honey bees have to fly a whopping 55,000 miles! Oh, and that’s despite the fact that a foraging honey bee visits up to 100 flowers – per foraging trip. So no wonder it takes about 556 foraging bees to visit 2 million flowers, just to make a pound of honey! Honey is the only food made by an insect, and eaten by both the insect and humans. So: ‘How do bees make honey’? It starts with foraging worker honey bees – and flowers, of course. 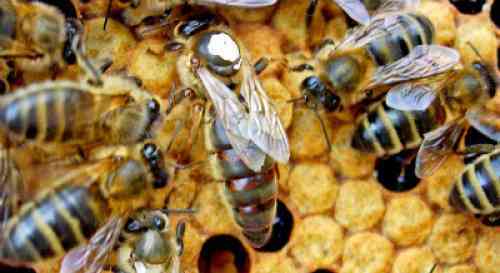 The male honey bees, (the drones), do not forage for the hive, and nor does the queen honey bee. As the weather begins to warm up, the bees will begin foraging on flowers. They will collect the sweet nectar from flowers within a radius of around 4 miles, and this nectar will then be taken to the hive. The bees have glands which secrete an enzyme. When the bees collect the nectar, it is then mixed with the enzyme in the bee’s mouth. Back at the bee hive or nest, the nectar is dropped into the honeycomb. These are hexagonal shaped cells, which in the wild, the bees make themselves out of wax. Initially the nectar collected and stored in the cells still has a high water content. After some time, however, the water content is reduced to around 17%. 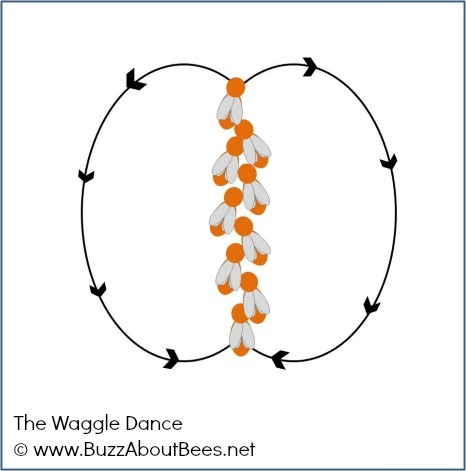 This process is aided by the bees themselves, fanning their wings, which helps the water to evaporate. Once the nectar solution has become thicker (more concentrated), at this point, the bees will cap the cells - which means adding a layer of wax over the hexagonal shaped honeycomb cells. 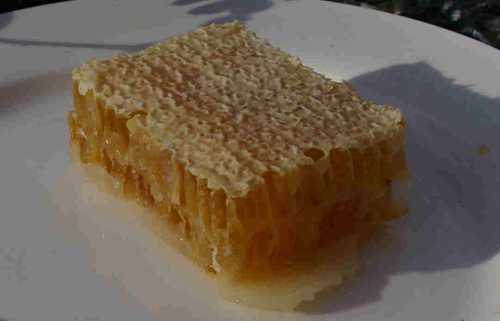 Below is an image of honeycombs the bees have capped with wax*. When bees are kept in hives, this is when beekeepers know the honey is ready to be harvested. Beekeepers will then move in to rob the hives. The image right shows the process of uncapping - which is removing the wax cappings from the combs*. The answer is that honey bees do not go foraging in winter when it's too cold - instead, the honey is their winter food. What this really means, is that beekeepers are essentially removing the honey bees' winter food stores. 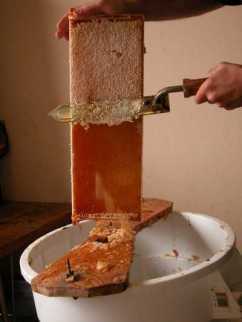 A few beekeepers may remove all of the honey, then replace this with sugar solution (which is less nutritious for bees), however, a fair-minded beekeeper will only take away what the honey bee colony can afford to lose, leaving the rest for the bees themselves. The honey the bees have stored can keep in these capped cells of the honeycomb indefinitely for the honey bees to eat when they need it, and when they will not be able to forage. During the winter, the colony will need to continue feeding around 20,000 workers and a queen. So in answer to the question about 'how bees make honey', the answer lies in much hard work from honey bees, especially during spring and summer! Honey bee workers born and active during this time will live for around 6 or 7 weeks, whereas those born in autumn may live 4 to 6 months. Do other bees make honey? Yes, Stingless Bees make honey, but not in the same quantity as honey bees, and the honey you purchase in a store will have been made by the honey bee, Apis mellifera. Do bumble bees make honey? Bumble bees collect nectar and store it for a short time in their honey pots back at the nest. However, they don't make honey in the same way that honey bees do - it's different. You can read more about this subject here. So, now you know about how bees make honey. Meanwhile, beekeepers go to a fair bit of expense and effort in setting up hives and keeping bees in order to bring you the honey you use on your bread or pancakes. Given the preciousness of honey, and the importance of honey bees, it's worth mentioning bee-welfare. Please purchase your honey with care, and be prepared to pay a fair price. Purchasing cheap, contaminated honey (including from overseas) puts pressure on local producers doing the right thing. In some countries, for example, some of the honey is not true, pure honey - for one thing, it may be mixed with corn syrup, and even contaminated with chemicals. See my honey buying tips. For this reason, I recommend you purchase honey form a local beekeeper if you can, a trusted supplier, or organic honey to help support more ecologically friendly land management practice, which is better for honey bees and other pollinators. Not all packaging is clearly or fully labelled. In an era where supermarkets compete with each other on price, to some extent, are we losing touch with the preciousness and indeed specialness of products like honey? The focus may be on 'cheap', but ultimately, I'm not so sure there is any such thing as 'cheap'. 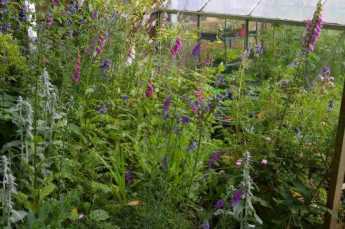 You can help honey bees by planting flowers in your garden the bees will enjoy, and by helping to raise awareness. 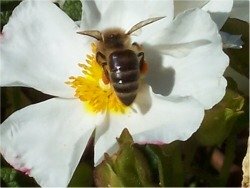 There are times when beekeepers must help honey bees by feeding sugar water (sugar syrup) - for example, after a poor summer with not enough flowers or occasions when bees can go out to forage. You can read more about why beekeepers feed sugar syrup to bees here. When and why do beekeepers feed sugar to honey bees? Find out more about why bees make honey here. So now we have answered the question How do bees make honey?, why not find out why they make it? What exactly is honey? Find out here. Old wives' tales, or are there really any health benefits of honey? Find out more about the wonderful world of honey bees, go from How do bees make honey? to one of these links! Read these fun Honey Bee Facts! Find out about the honey bee life cycle.